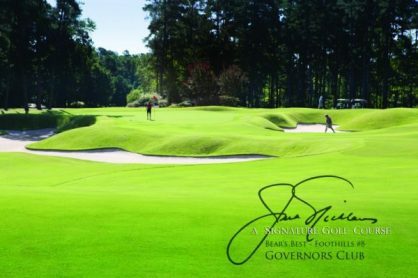 Ranked sixth in the Piedmont Top 10 and 20th in NC; numerous other distinctions, including being classified as five-star golf. The 27-hole Jack Nicklaus-designed golf course is carved out of the highest topography in the region around Edwards Mountain, giving the golfer magnificent vistas of all he surveys. Conference room, perfect for groups interested in a working lunch or other function. Reserve for parties, meetings, and other gatherings. Golf Course Description: 27 holes of golf designed by Jack Nicklaus who combined challenge and beauty in perfect harmony. The layout follows the contours of Edwards Mountain, skirting serene lakes and quiet woodlands and winding through the neighborhoods of Governors Club.